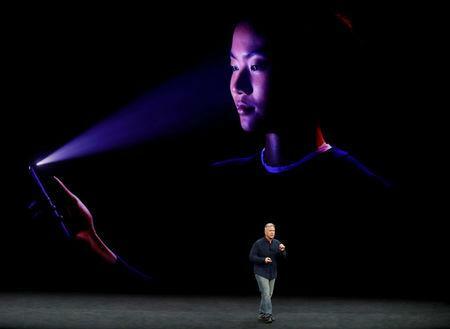 (Reuters) - Most Android phones will have to wait until 2019 to duplicate the 3D sensing feature behind Apple’s Face ID security, three major parts producers have told Reuters, handicapping Samsung and others on a technology that is set to be worth billions in revenue over the next few years. "This kind of functionality is going to be very important for AR," said Gartner analyst Jon Erensen. "I think that is something where you don't want to get left behind." In particular, Android producers are struggling to source vertical-cavity surface-emitting lasers, or VCSELs, a core part of Apple's Face ID hardware. "It is going to take them a lot of time, the Android-based customers, to secure capacity throughout the whole supply chain," said Bill Ong, senior director of investor relations from Viavi, seen as the only major supplier of optical filters needed for the 3D sensing modules. "We may have a potential introduction of a second handset maker into 3D sensing at the end of this calendar year. (But) the volumes would be very low. In 2019 you clearly will see at least two or more android-based phones," he added. Apple's effort to get ahead with the technology is the latest evidence of an aggressive approach by the Cupertino-based company to making the most of the technological advances its financial firepower can deliver. The iPhone maker's $390 million deal in December to secure supplies from VCSEL-maker Finisar was one such move. Another is Apple's discussions with major cobalt producers to nail down supplies for lithium-ion rechargeable batteries that power its mobile phones. "Apple is always very focused on its supply chain," says Gartner's Erensen. "When it comes to new technologies like this and implementing them to new phones, it's one of the ways that Apple can really can be aggressive, differentiate and take advantage of the position they have in the market." Lumentum, which declined to comment, is ramping up additional manufacturing capacity for VCSELs and edge-emitting lasers for the first half of fiscal 2019, according to the company's earnings call. "Each customer has their own adoption timeline and rollout plan, which we can’t discuss, but we expect the market opportunity for VCSEL technology to increase substantially in 2019," he says. "As part of a combined external and internal VCSEL supply chain where an external volume production supply chain is available to us, we are currently building internal VCSEL production capacity in Singapore," Moritz Gmeiner, head of investor relations for AMS, told Reuters. "I expect this capacity to be available for mass production next year."